Australian Customs and Border Protection Service manages the security and ntegrity of Australia's borders. It works closely with other government and international agencies, in particular the Australian Federal Police, the Australian Quarantine and Inspection Service, the Department of Immigration and Citizenship and the Department of Defence, to detect and deter unlawful movement of goods and people across the border. The agency is a national organisation employing more than 5500 people in Australia and overseas, with its central office in Canberra. It has a fleet of ocean-going patrol vessels and contracts two aerial surveillance providers for civil maritime surveillance and response. 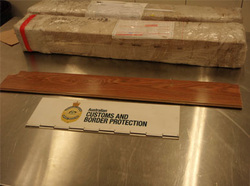 Protecting the Australian community through the interception of illegal drugs and firearms is a high priority and sophisticated techniques are used to target high-risk aircraft, vessels, cargo, postal items and travellers. This includes intelligence analysis, computer-based analysis, detector dogs and various other technologies. Clients of Customs and Border Protection include the Australian community, the Government, industry, travellers and other government agencies.